Hanson Original represents the coalescence of architecture, jewelry, and culture, presenting the vision of architecturally inspired jewelry for everyday wear. 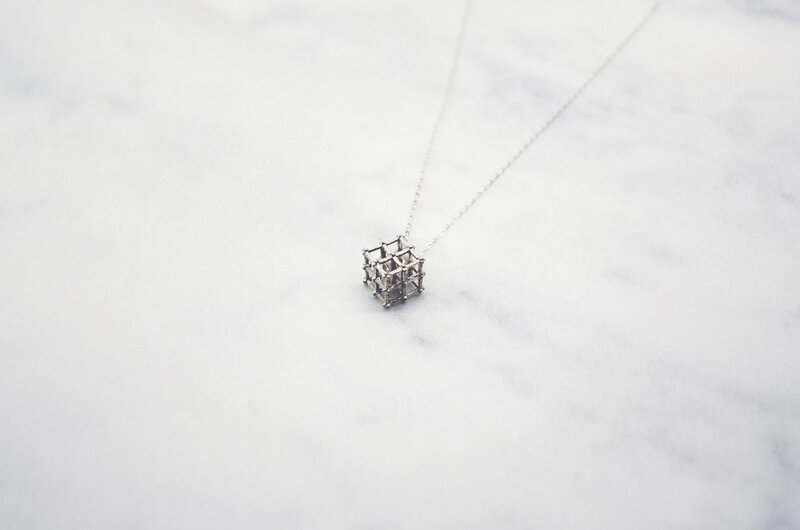 Governed by geometry, proportion, and scale, each piece is uniquely crafted by combining digital additive manufacturing with traditional lost wax casting and handcrafting methods. The human body becomes the site in which we design for. Hanson Original’s distinctive style resonates with the sensibilities of the wearer. Never overstated, each piece is easy to wear, complementing on one’s style and voice. Each piece is individually printed, cast, and hand finished, and may vary slightly from one another. Hanson Original pieces highlight the convergence of precise digital printing with traditional casting techniques. The individuality of each creation is embraced and celebrated. .925 Sterling Silver // Classic & Formal. Characterized by vertical members and diagonals that slope toward the center, the Pratt/ Howe trusses are found in traditional bridge designs, early aerospace development and building elements. .925 Sterling Silver // Simple & Strong. The Baltimore truss is characterized by additional bracing in the lower section of the truss to prevent buckling and control deflection, commonly used for rail bridges. .925 Sterling Silver // In the form of a K. Characterized by vertical members and two diagonals, the vertical members are broken up into smaller sections to better resist buckling in bridge design. .925 Sterling Silver // Without verticals. An uncommon truss configuration, the truss takes the appearance of two Warren truss offset and superimposed on each other, forming a repeating “X” pattern. .925 Sterling Silver // Rigid & Secure. The lattice is an open framework structure made from a criss-cross pattern of strips to form a network of crosshatch sections that strengthen the whole structure. These structural properties are commonly found in scaffolding structures. The human body becomes the site in which we design for. Hanson Original’s distinctive style resonates with the sensibilities of the wearer. Never overstated, each piece is easy to wear, complementing on one’s style and voice. Behind every single piece is an intriguing tale of history and development, drawn from the architecture which surrounds us. By sharing this, we forge a bond between the maker and wearer, and between the wearer and their surroundings.